Sometimes a name survives beyond its natural life. Take that of Richard Walter Parson, little could he have imagined back in 1842 when he set up business in Plymouth, that some 177 years later the enterprise would still be running under the same family name. Richard Walter Parson was a carpenter and joiner from Stoke Climsland, on the other side of the Tamar, in Cornwall. When he set up here as a builder and undertaker, the approximate cost of a funeral, or at least of a polished elm coffin, a hearse, coach and cemetery fees, was around four pounds, and clearly not affordable for all. The firm was passed to Richard’s son, John Walter Parson, in 1885, but even as late as the 1920s communal services were the order of the day for all but the well to do and the minister would typically go around from grave to grave for the committal service. It was Richard Walter’s great grandson, Walter Cyril Parson who would be among the first to challenge this way of working. Walter was the fourth generation of Parson to go into the family concern and, weary of finding himself overseeing the last funeral of a lengthy number being dealt with in one day, he asked the Minister what would happen if he arrived late for a funeral. The Minister replied that he would fine the firm half a crown (12.5p). Not withstanding inflation this was still a comparatively modest amount and Walter took the view that it would be better to pay the fine, keep the Minister waiting and effectively have the Minister’s undivided attention rather than one that was effectively lost in the melee. Thus it was that, thanks to Walter Parson, the idea of individual funerals for all, rather than just the landed gentry was born in Plymouth. The notion went national very quickly. Walter Cyril Parson had bought the firm from his father, Oscar Walter Parson, in 1932 and kept a steady hand on proceedings until he was called up in 1940 to serve his country as a pilot in the RAF. At that point his father came out of retirement and ran the business until his death in 1944. Walter was still at service at this point so his wife, Beryl, decided that rather than let the business fold or go on hold, she would take over until such time as the war would end and Walter would come home. At that time, it was highly unusual for a woman to be running any sort of business and the move prompted much interest as the mother of four became, it was claimed, the only female undertaker in the country. Ten years after the end of the war, with Walter back in charge, one of those four children, Wally junior, entered the business and after a short break to study and work, returned in the 1960s and became a partner in 1976. By this time another of the four children, Pat Ware, had entered the fray and she too was to become a partner, in 1980. 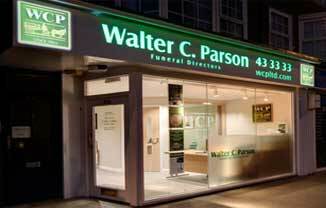 Walter senior maintained an involvement with the family firm right up until his death in 1987. Later that same year, Pat’s son, Stephen Ware, who had first joined in 1982, and Graham May, who had joined in 1973, both became partners. Stephen’s appointment brought the Parson connection into its sixth generation, and Wally himself retired in 1999. Over the next decade or so, Pat, Graham and Stephen embarked on a programme of expansion, begun by Wally, that has seen the firm more than double in size from four offices (Plymouth, Plympton, Crownhill and Ivybridge) to eleven, with outposts now in Tavistock, Callington, Torpoint, Saltash, Newton Abbot, Torquay and Exeter. In 2014, Stephen’s son, John Ware, the seventh generation of the Parson family joined the firm, having gained a First Class BSc (Hons) degree in Business Management from the University of Surrey and spending a short time working in London. Today one of the best known names in the business is still thriving under its present regime after 177 years, and it is hoped that the seventh generation will take it forward towards a 200th anniversary and that would be some milestone!